An advance notice is to be said: the operation is so simple that it can be done with a tool made of materials at hand. Such contrivance is named usually as “a small cunning”. For instance one can take a plastic bottle approximately 10 cm (4 inches) in diameter with a cone neck. The skein is to be put on the neck of the bottle filled with water to enlarge the mass that makes the bottle to be steady. The easy skein rotates around the bottle neck when thread is rewound around the clew. Of course one can feel the winding uncomfortable because of primitiveness of the tool but the goal is achieved tolerably. The more skilful master can make a specialized tool for rewinding that eliminates grave shortcomings of the “bottle construction”. It is recommended to use a spool of a spinning rod. 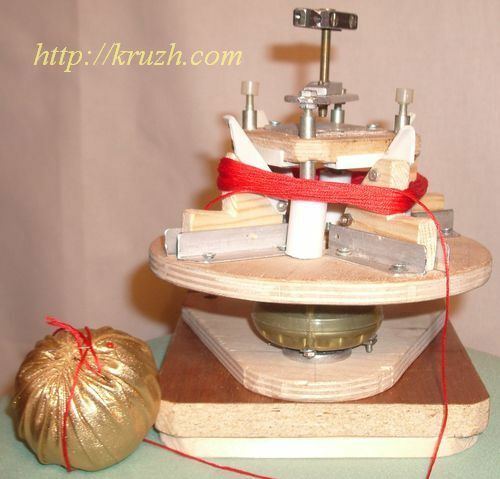 The spool with 10 cm (4 inches) in diameter is set on a ball bearing. Thread is rewound easily without entangling. It remains only to fasten the spool to a platform or to the table with a screw-clamp. At last one can cease looking for ready devices that are made for solving other technical tasks. It may be more productive to design a device intended for rewinding exclusively. Such a device must have small friction of rotation and adaptation to changing of skein size. It is proves to be possible to realize the tool even in domestic workshop. The contrivance for rewinding of thread from the skein to the clew is shown on the cinematic scheme (Fig.3.2). The vertical axe of the disk plate 1 is fastened to the ball bearing 2. Four wedges 3 are set on the plate 1 along radius with step 90 grades. The wedges slide on the plate surface when the thrust plate 4 moves upwards and downwards. Every wedge is covered with ledge on the extern side. The ledges are intended for packing of the skein 5. The wedges take position in accordance with skein sizes. Plate 1 and wedges rotate together with the skein when thread is rewound. Two important features of the device are not shown on Fig.3.2. 1. The wedges are tightened with springs toward the axe of gyration. 2. The thrust plate 4 is fixed in position according to the skein diameter. When fixation is released, the plate 4 are pushed upwards with the wedges which moves toward the gyration axe. As a result the distance L between external sides of the wedges shortens. Every wedge has a cover plastic plate having mirror surface to weaken friction between the wedge and the plate 4. 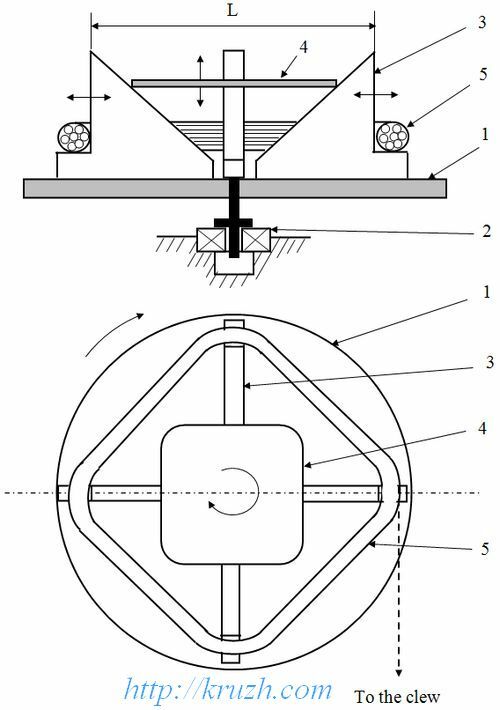 The rewinding device is shown on the photo (Fig.3.3). It is fulfilled as an autonomous unit that can be set apart or can be mounted together with other tools on the working place. Details of the device are made of accessible materials. Plywood is used for the plates 1 and 4. Four wedges are made of wood. Guide-bars for them are made of aluminum profile. The gyration axe is substituted with four short pillars mounted into the plastic body of the roller (a detail of skate board). Two ball bearings are pressed into the roller.